Provides insight into the role of the media in creating and reinforcing age stereotyping and discrimination. Quantitative research using an online survey. These are the Key Findings from the research. Finding: Ageing is a loaded term and holds predominantly negative connotations – particularly among younger Australians. Younger Australians (under 30 years) are generally the most negative about the concept of ageing. Younger Australians are more likely to associate ageing with the concept of loss (loss of health, loss of hearing, loss of mental capacity, loss of income). Younger Australians find it extremely difficult to identify any benefits associated with ageing and indicate it is simply not something they have given much thought to at this point in their lives. Finding: Younger Australians and older Australians define ‘old age’ differently and this creates tensions between them. Younger Australians feel that age is numeric and defined by an actual age. For older Australians, age is not just a number, but is influenced by broader social, emotional and relational elements. Many people over the age of 65 years do not feel that the term ‘old age’ applies to them. They feel that the horizon of ‘old age’ shifts as they age. The mean age of ‘old age’ for younger Australians is 55.9 years, compared to 66.9 years for older Australians. The mean age of someone who is ‘elderly’ for younger Australians is 66.7 years, compared to 74.4 years for older Australians. Older Australians feel that differences in perceptions of ageing and old age create tensions between them and younger people – with misconceptions about age and ageing underpinning many negative stereotypes. Finding: Most Australians feel that age discrimination in Australia is common. 71% of all Australians feel that age discrimination in Australia is common (47% common, 24% very common). Findings for business respondents are consistent with the community sample (53% common and 18% very common). social situations (56% business and 57% community). Almost half of all Australians feel that discrimination is present within the healthcare system (52% community, 49% business), within government policy (44% community, 45% business) or in access to services (46% community, 43% business). Finding: More than a third of Australians aged 55+ years have experienced age-related discrimination. 35% of Australians aged 55-64 years and 43% of Australians aged 65+ years have experienced discrimination because of their age. being subjected to jokes about ageing (53% of Australians aged 54-65; 53% aged 65+). cultural invisibility: a lack of representation in popular culture leading to a feeling of being overlooked, devalued or ignored. Finding: Age discrimination and invisibility result in a strong and negative emotional response. A result of age discrimination and invisibility is that older Australians feel a sense of shame, anger or sadness. There is also a direct impact on personal perceptions of self-worth and an impact on how older Australians define their experience of ageing. Question: How did this (discrimination) make you feel? Base: All respondents who experienced discrimination (n=199). Finding: Those aged 18-34 years are the least concerned about age discrimination. Younger Australians feel that age discrimination is not as negative as other forms of discrimination, such as race or gender. 81% of those aged 55-64 years. Finding: Many Australians agree with a number of stereotypes about older Australians. 59% of Australians feel that older people are more likely to be lonely or isolated. 52% feel that older people are more likely to be victims of crime. 51% feel older people are more likely to be forgetful. 43% feel older people don’t like being told what to do by someone younger. Finding: Those aged 18-24 years are the most negative about older people. do not care about their appearance (17%). Younger business decision makers are more likely to agree with all negative statements about the capabilities of older workers. Social media tends to show older people in a more negative light – younger people are more likely to engage with social media. Finding: Negative stereotypes about older Australians lead to negative behaviours. 44% of Australians feel sorry for older people as they are perceived often to have complex health problems. 35% of Australians feel they often have to take extra time to explain complex topics to older people. 20% of Australians avoid conversations about technology with older people as they feel explanations will take a long time and a lot of effort. 13% of Australians tend to speak louder to older people as they assume they cannot hear that well. 11% of Australians sometimes tell jokes about older people. These jokes can have a negative impact, particularly when the joke-teller is younger than the recipient. Younger people are more likely to display negative behaviours toward older Australians. Finding: One in ten business respondents have an age above which they will not recruit – the average age is 50 years. 50% of business decision makers agree that older employees are at higher risk of being made redundant. This belief is significantly more likely to be held by smaller businesses (63% of those with less than five staff agreed this was the case). 36% of business decision makers believe that older employers are less likely to be promoted. 29% of business decision makers believe that older employees have difficulty adapting to change. 23% of business decision makers agree that older employees will not be in the role as long as younger employees and that it is difficult to teach older workers new things. 22% of business decision makers agree that they do not expect older employees to have the same technical skills as younger employees. Finding: Older Australians are underrepresented and often poorly portrayed in the media. people aged 55+ were referred to in only 11.5% of the editorial media content. Many older Australians feel that the media plays a significant role in contributing to a sense of invisibility of older people through limited, homogenous portrayals of older people. 61% of the Australian community feel that the portrayal of older people in the media is ‘unfair’. Only 19% of Australians feel that the media portrays older people in diverse ways. Only 16% of Australians feel that there are enough older role models portrayed in the media. Only 21% believe that there are generally as many positive stories in the media about ageing as there are negative stories. Finding: The media influences negative perceptions of older Australians. Older people in the media are most often portrayed as frail, weak, victims or in poor health. 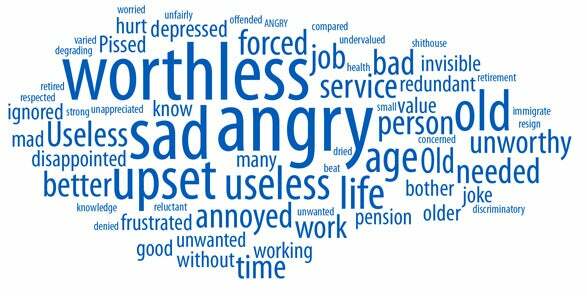 The most common words Australians use to describe the portrayal of older people in the media are forgetful, slow, frail, vulnerable, burden, grump and sick. Over 70% of Australians feel that stories they have seen or read in the media influence their perception that older people are victims. Around 60% feel that stories they have seen or read reinforce their perception that older people are lonely or isolated. 62% feel that stories they have seen or read influence their perception that older people are bad drivers. Around 60% feel that stories they have seen or read in the media influence their perception that older people are more likely to be sick. Finding: Social media portrays older people as vulnerable and as victims. Peaks in social media discussion are focused around reports of older people as victims of crime, or as otherwise physically vulnerable or at risk of illness. The vast majority of high membership age-related Facebook sites relate to aged care and issues associated with caring for the elderly. While they are generally positive in tone, they are homogenous in content and show little diversity. Despite having relatively high membership, Facebook pages generate relatively little flow-on discussion. For example, the Just Better Care Fanpage had 2,909 members, yet only 6 people were ‘talking’ about the page. For each of the leading age-related Facebook pages and blog sites, the most active voices are the page administrators. Finding: 47% of Australians feel that the portrayal of older people in advertising is ‘unfair’. Show older people as normal people living normal lives. Show older people in roles that contribute to Australian society. Reduce the fear associated with the portrayal of older people as victims. “While some older people are fearful, a lot are not. I believe that older Australians are often influenced by the media, which means that they are often ‘made’ to be fearful by inaccurate reports, which then becomes a cycle of fear”.